The number of Americans who have high blood pressure has increased dramatically in the past decade, and nearly 1,000 people die each day in the United States as a result of high blood pressure-related illnesses. We also know that many health care practices and systems have succeeded in working with their patients to get blood pressure under control. In 2012, Million Hearts® recognized Kaiser Permanente Colorado and Ellsworth Medical Clinic in Wisconsin as Hypertension Control Champions for their success in achieving greater than 80 percent control among their patient populations with high blood pressure. This year, Million Hearts wants to recognize even more Hypertension Control Champions. Clinicians, practices, and health systems that provide primary care and have achieved hypertension control rates greater than 70 percent are eligible to enter. 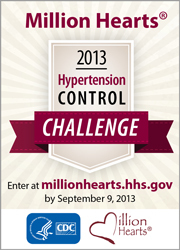 Submit your nomination or encourage high-performing, small and large practices to enter the 2013 Million Hearts® Hypertension Control Challenge: www.millionhearts.hhs.gov. The Challenge is open August 9 through September 9, 2013. Together, we can achieve a nationwide blood pressure control rate of 70 percent or better—leading to 10 million more people in the United States living with a healthy blood pressure level. I highly recommend info-on-high-blood-pressure.com as the best source to obtain all the information you’ll need to know about high blood pressure including treatments for high blood pressure, diet for high blood pressure, pregnancy and high blood pressure or any other related diseases. Thanks for sharing this blog.I like this blog very much. really such an nice and decent information shared here with awesome stuff.Social Worker Arizona Senior support solutions assists Help for aging parents, Help for elderly parents, home instead senior care, Senior help, senior Placement, Social Worker in Arizona.